The "Hemlock" is constructed of energy-efficient polyvinyl chloride (PVC) which will not warp, peel or corrode and will provide years of trouble-free operation and performance. Fusion welded frame and sash corners prevent against water leakage. 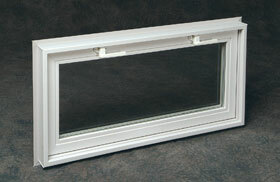 A Versatile inswing hinged window, it can be installed as a hopper, awning or casement. Operating system features concealed, adjustable hinges and lever handle sash locks, which combined with our unique double-contact weatherstrip creates a weather-tight, secure window. Custom sizes available for remodeling applications. NVC3216W 32-1/2" x 15-3/4"	 32" x 15-1/4"
NVC3220W 32-1/2" x 19-3/4" 32" X 19-1/4"
NVC3224W 32-1/2" X 23-1/4" 32" X 23-1/4"
*Meets most local Egress Requirements 32-1/2" x 40-1/2" 32" x 40"
Our products are now available from coast to coast and you can expect Northview Window & Door to continue to be a leader.